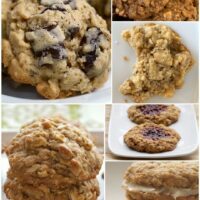 I’m so excited to share these cookies that feature some of my favorite flavors all in one place. We’re talking chocolate and almonds and coconut. Who’s with me? 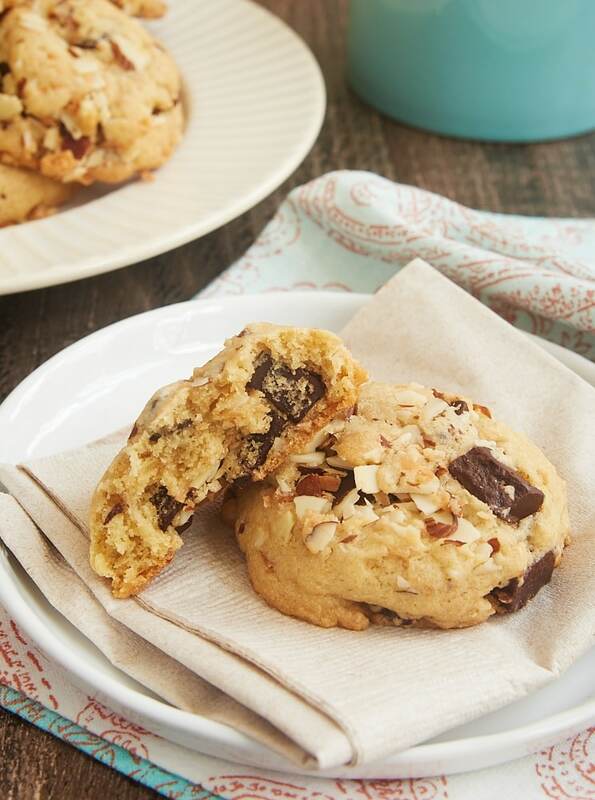 At their heart, these are chocolate chip cookies. We all love chocolate chip cookies, right? But let’s not stop there. 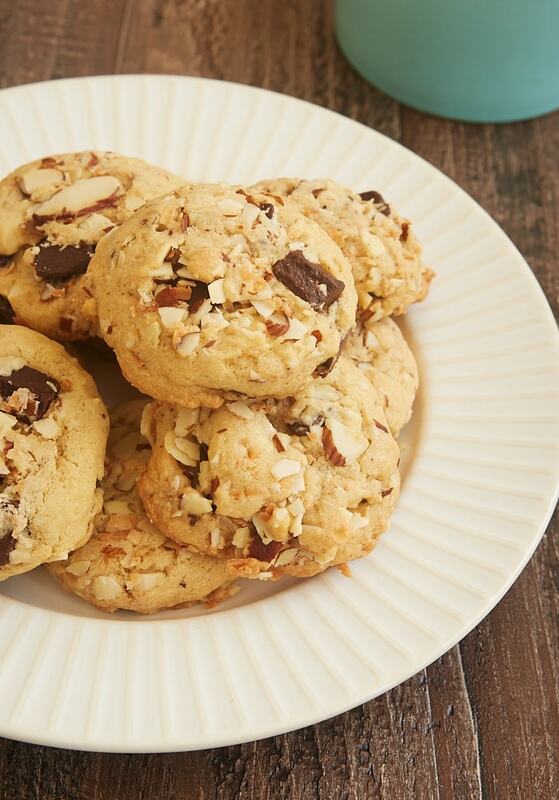 We’re adding plenty of toasty coconut and almonds to take them from great to fantastic! I find that toasting the coconut and almonds is well worth the extra prep time. The flavor that it adds is so, so good. Of course, if you’re in a time crunch, you can skip the toasting. The cookies will still be plenty delicious. I’m not as big a proponent of chilling cookie dough as a lot of people. It’s a matter of preference, really. But this dough will really benefit from a bit of refrigerator time. About an hour of chilling will not only help keep these cookies from spreading too much, but it will also enhance the flavor and add a nice chewiness. You can chill the dough longer if you like or if that works better for your baking schedule. If covered, you can keep the dough in in the refrigerator for a few days. 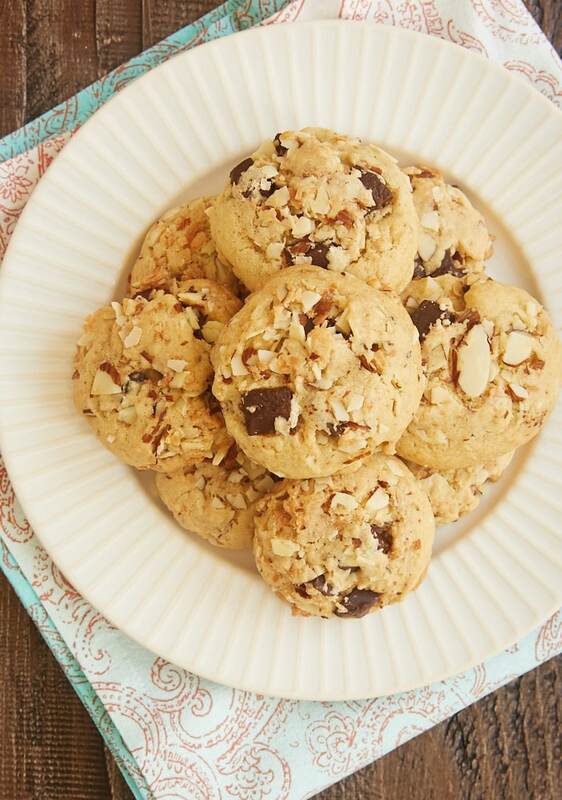 These cookies are soft and sweet and chewy and crunchy and bursting with amazing flavor. They fall into that “dangerous” category for me. I can’t have them near me and not want to eat one or two. 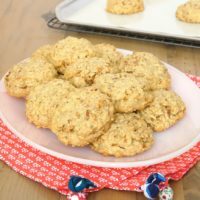 If you’re a fan of these sweet and nutty flavors, too, then I think you’ll agree with me that these cookies are really phenomenal. And if you think they might be dangerous for you, too, then I’m guessing you won’t have much trouble finding friends to take some off your hands. Or freeze some dough for those future cookie cravings! 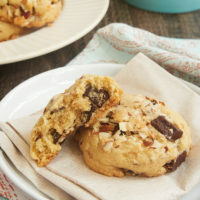 There is SO much amazing flavor in these soft, sweet, chewy, crunchy Coconut Almond Chocolate Chip Cookies! Whisk together flour, baking powder, baking soda, and salt. Set aside. Using an electric mixer on medium speed, beat the butter, brown sugar, and sugar until light and fluffy. Add the eggs, one at a time, mixing well after each addition. Mix in the vanilla. Stir in the chocolate chips, coconut, and almonds. Chill the dough for an hour. 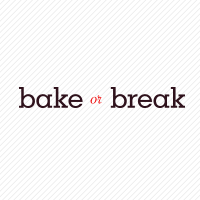 Drop the dough by two tablespoon portions onto the prepared pans, leaving about 2 inches between cookies. Slightly flatten the top of each cookie. Bake 14 to 16 minutes, or until lightly browned. Cool on the pans for 5 minutes. Then transfer the cookies to a wire rack to cool completely. 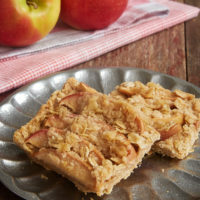 *To toast, spread the coconut and almonds in a single layer on a lined, rimmed baking sheet. Bake at 350°F for 12 to 15 minutes, or until toasted. These look delicious and will probably make them sooner than later. I started chilling my cookie dough when I was working full time. 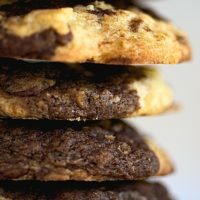 I would mix up the cookie dough, refrigerate and then, the next day or so, would bake my cookies….that way, baking felt like a breeze for me…divide the task. I also do as much ahead as I can like toasting my nuts and storing toasted nuts in containers. I am retired now, but I still try to do ahead and chill my dough. I think the flavors meld much better. 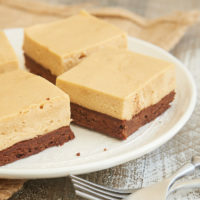 My family was spoiled by always having homemade desserts in the house, and with working full time, and keeping up with a family, plus cooking my meals at home….this worked the best for me. I love your blog. Thank you for being a part of my kitchen. Hi, Karen. I’m glad you’re enjoying BoB! You’re absolutely right about dividing up the work, Karen. I also like to keep cookie dough portioned and ready to bake in my freezer so I can have freshly baked cookies in short order! But there’s always a first time, I guess! Just a little question: I’m Italian and here in Italy we have Celsius degrees. so 350 °F will be roughly 180 °C. How about cooking time? is it better to cook them for only 14 minutes, since 180 °C is slightly more than 350 °F? Hi, Nadine. Yes, the cookies will probably bake a little faster. I’d aim for the lower end of the time range given, and then check for doneness.